The continental climate of Pannonia, the land between the Eastern tip of the Alps and the Karpatian Mountains, with it's hot summers and cold winters, is not only perfect for growing wine, paprika and fields of sunflowers. It's also the perfect climate for Acacia trees. For generations our Master's family has been manufacturing barrels made from Acacia wood. Our Master stores the logs for two years in his yard. Then he saws, he bends, he burns the inside, he sets the metal rings, and he finishes each barrel with oil or paint. All work is done with traditional tools in his workshop—precisely piece by piece. Acacia wood is famous for it's durability. The traditional inside burning and the treatment with oil or varnish enhance the lifetime even more. 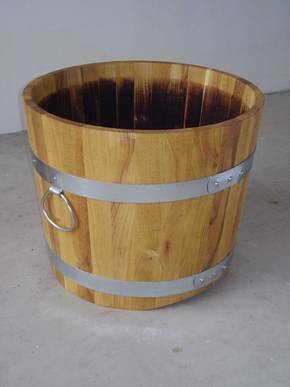 “Arched legs” provide circulation and prevent humidity under the barrel, a real advantage for tub and plant. A wide variety of models and sizes helps to accommodate each plant size. Heights and diameters range up to 120cm.